I am joining Flak Photo and creator Andy Adams to host an online community conversation on the Flak Photo Books Facebook page focused on essays from Gerry Badger’s recently published book of essays, "The Pleasures of Good Photographs." This public discussion provides a structured setting for expanding our understanding of the essays by reading collectively. All are welcome to join in! We began with the essay, "Literate, Authoritative, Transcendent: Walker Evans's American Photographs" and the conversation continues this week of Monday, May 21st with the essay "A Certain Sensibility: John Gossage, the Photographer as Auteur." (page 87) A full reading schedule can be found here. I am following up on these community conversations with posts here on fototazo that will recap a selection of the ideas we discuss. These follow-up posts will necessarily be an abbreviated selection given the length and quality of the conversation in the community discussion threads. In many cases, what arose from the conversation were questions and ideas to continue to explore, and not necessarily conclusions or consensus. My goal with these follow-up posts is to pull out threads from the weekly discussion that can be applied beyond the individual essays to inform our general understanding of the medium itself. We found quickly that a core issue for a group conversation is the importance of defining terms. As the conversation evolved, the differentiation between the words "truth," "reality," and "accurate" became crucial for understanding one another. We generally came to an understanding of "reality" meaning the world in which we live physically, "accurate" to mean the fidelity of a representation to something in reality, and "truth" to mean...well, I don't think we ever came close to an agreement. See below. The healthiest argument of the week focused around the perennial issue of truth in photography. The issue of how to use the term was an issue from the start. Was truth a measure of how "accurate" an image is? Was truth a problematic term leading us all into the winter woods at dusk with no matches? Is there a single truth? Many truths? Defining "truth" started to pull us into larger conversations of philosophy and semantics. It was suggested that we define the term. It was suggested we stop talking about the term. Safadi replied, "I think it is very telling that the words 'his truth' rather that 'a truth' or 'the truth' are used in that sentence. 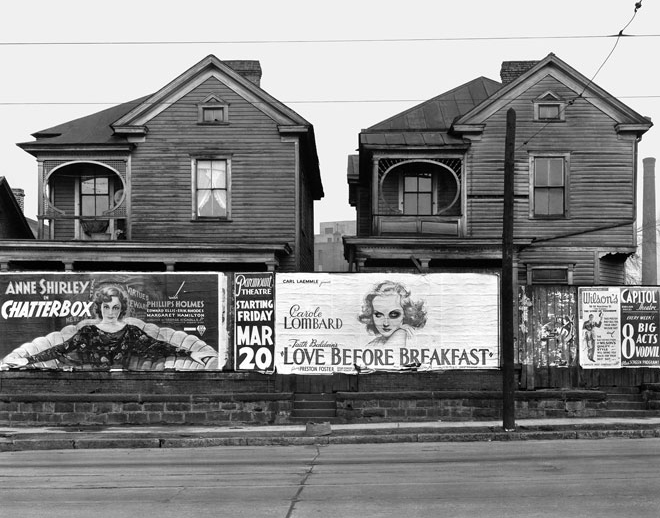 Walker Evans may have preached for the capturing of reality free of manipulation as a tenet of documentary photography, but he has been accused of rearranging objects in some of the photographs he made. Are those manipulated photographs factually truthful? They are not if the threshold is transcribing a place and time as it existed in that precise temporal chunk that the camera has sliced away. Are they pieces of the photographer’s subjective personal truth that he / she wanted to reveal to us, where that truth transcends the actual and factual physical reality? I believe they are." These comments represented one side of the conversation that argued for a separation of "accurate" (as defined above) from "truth" and a vision not just of a single truth, but different kinds of truth. One could be "accurate." Another could be a sense of "emotional truth" or a sense of rightness about an image. The fundamental and eternal debate on truth in photography was not fully resolved this week by our discussion group. Connected with the conversation on truth arose the related, but separate issue of construction in photography. It started from the same passage in the essay cited above, in which Badger writes that Evans believed a photographer must discover, divine, and reveal his truth rather than construct it. As part of this conversation, contributor John Armstrong wrote, "Constructedness is the original sin of photography" and Bonita Springs, Florida-based photographer Dennis Church that "I believe all images are constructed, some more consciously than others." Others felt accepting "construction" as a part of all images without establishing some guidelines would risk equating documentary work and photographers like Gregory Crewsdon. Like in the conversation on truth, we discussed the idea of construction being on a spectrum that avoids the duality of an image being "constructed"or "not constructed." Instead, images would be seen through degrees of construction with complete construction of a scene on one side of the spectrum and construction by unavoidable decisions on lens choice, perspective, and cropping on the other side. The point was made that the question of "truth" in photography may rely on time; that the truth-value of an image may actually shift according to public perceptions of photography over time. This suggests any photographic truth is not an absolute, but something that may be redefined in relation to changes in the history and understanding of the medium. As an example, the work of Alexander Gardner, accepted as "photojournalism" in the 1860s and therefore likely seen in its day as mostly truthful in terms of depicting an event that actually happened, today would be labeled as less "truthful" (in these terms) because the contemporary code of photojournalism does not provide for moving objects and bodies in an image. The image itself would therefore be less "true" today than in the past due to shifting perceptions of what is acceptable in photojournalism. One of the bigger points of disagreement during the week was over the state of belief we have in photography in contemporary life. This seems an issue that truly divides current thinking on photography. Where you get it wrong is claiming that photography has no franchise on reality, it does. Educator and photographer Angela Kelly made the point towards the end of the week that, "A readerly approach while taking into account the artists intention suggests the larger meaning of a work of art lies somewhere between the artists intention and the audience or even critic who encounters it within a different context." Massingham followed by writing "What happens once the work is thrown open to public scrutiny (either in book form or as an exhibition) is both fascinating and complex. Arguments are developed, and theories espoused, all of which inform our understanding of the works of art in question. However, there are ocasions when this process of examination is presented as the primary concern of the work - the original context and intent relegated to some dark redundent corner of history. To accept that contemporary theory and observation can be interwoven at will with historical works - without contradiction or complication, is troublesome to say the least." This conversation about where meaning is created in art, and the potential dangers of disregarding original intent, is one I hope we continue to investigate during the coming weeks in our essay discussions. Badger writes that Evans is the "most American of artists." (28) This raised the question of who we would say defines "American photography." Texas-based photographer Pugilist Press included Robert Adams, William Christenberry, William Eggleston. Wright Morris, Ed Ruscha, and - in the way they approach the American Image in a similar way - Cindy Sherman and Philip-Lorca DiCorcia on his list. Safadi added, "Those who, for me, define American photography during the period that spans the beginning of the 20th century all the way through to the start of the 2nd World War include the greats such as Ansel Adams and Edward Weston as well as [Alfred] Stieglitz, [Lewis] Hine, [Paul] Strand." The question of which photographers define "American photography" remains another question to continue pursuing during the coming weeks. Badger's argument for Evans being the most American of artists rests largely on a passage in the essay in which he addresses the object in the history of American art. One contributor summarized it well: "'The integrity of the object' – I think the crux of Badger’s argument lies within that statement. If, for Badger, the fundamental essence of American art (and what actually defines it) is indeed the integrity of the object being depicted then certainly the medium of photography provides that integrity as part and parcel of its true nature. And that is why, in his point of view, the American sensibility lends itself to the photographic medium as the mode of expression that allows for the transparent means of capturing/depicting the object in its entirety (faults and all)." And Pugilist Press added: "I will say that Americans have a special relationship with the object that while not that singular in experience seems to be singular in cultural expression. It has something to do with the potential for splendor in the vernacular and a penchant for sensuality. It's Elvis' Blue Suede Shoes, American Graffiti's cars, those baubles from The Man in The High Castle, Ignatz' brick." Both make good points. While also keeping in mind that America in popular thought is connected with object creation, consumption, and possession, however, a hanging question from this conversation is whether the object has a particular place in American High Art, and not just in popular cultural expression. Badger seems to say so, couching his argument for Evans as a quintessential American artist by drawing Evans' connection to the history of the object in US painting. But what about Dutch still lives? And Cézanne? And Morandi? The incredibly detailed objects in a Thai Ramayana mural? Is the connection between the object in High Art and America really unique? Could we equally argue that landscapes are uniquely "American" with US ties to the Western frontier, the New World, and Manifest Destiny? We also considered the narrative potential of photography this week. To what degree can photography tell stories? What are the limits of narrative in photography? We talked - in the shadow of a previous conversation on truth and construction in a single image - about the subjective control of the message of a photobook through sequencing images to create narrative. Leeds, UK-based photographer and educator Philip Welding raised an interesting point: "Badger compares [American Photographs] to an epic poem, film or novel; all very much fictional constructs. It seems more comfortable to recognize this artifice within book form than when discussing the photography itself." It's a good question - are we more comfortable with accepting the artifice of sequencing, editing, constructed narrative, and presentation decisions than we are with the idea that a photograph itself is a constructed fiction? To push a step more: does questioning the "truth" of an image itself threaten our understanding of reality and ourselves in a way that causes many of us to want to defend it, while we understand and accept the fiction of a narrative sequence, edit, and presentation more comfortably? One last point. A text can be read in two ways - first, to understand the author's intent, to push to understand what the writer says, and to engage the author on their terms. The second, equally important and perhaps more important for photography practitioners and non-academics, is reading a text to find what we need for our own practice and thought processes, regardless of a more literal analysis of what the author intended. Bill Evans, the jazz pianist, once said that he was a Buddhist, but didn't want to learn anything more about Buddhism. What he understood Buddhism to be, he said, was exactly what he needed it to be. He was afraid that if he learned more about it, he might discover that it wasn’t actually what he understood and wanted it to be. This spirit is important to maintain in our reading, especially of more academically-oriented texts. Rather than pinpointing an understanding of the author’s argument on a particular part of a photographer’s career, frequently letting a sentence or idea resonate so that it leads us to an understanding we can apply to our own work gives us more from our reading, even if it’s not exactly accurate....true...real...wait...uh oh...the original intent of the text itself.